You can learn a lot about the human nervous system by observing microscopic roundworms known as C. elegans. And that’s what Assistant Professor of Biology Jennifer Kowalski and her students will be doing for the next three years, thanks to a $372,869 grant from the National Institutes for Health. The grant, which took effect May 1, will pay for salaries (including summer student stipends), supplies, conference travel funds, and some equipment necessary to study the role of an enzyme called the Anaphase Promoting Complex in regulating the ability of neurons to communicate with muscle cells, which is important for controlling movement and is a model for other types of neuronal communication. While C. elegans are common soil-dwelling organisms, Kowalski and her students – including rising seniors Hitesh Dube and Amy Wasilk – maintain and work with laboratory strains of these roundworms. They grow the worms, which are about a millimeter long and barely visible to the naked eye, on round plastic plates containing an agar medium and bacteria (the worms’ food source). They then perform a variety of experiments to manipulate and study the function of the nervous systems of normal worms compared with those of genetic mutant worms that lack the function of various neuronal proteins. In one experiment, they measure the amount of neuromuscular signaling in the worms by giving them a drug that causes muscle paralysis then quantifying the rates of paralysis of the worms over time. They use sterilized a platinum wire to poke the worms to make sure they’re paralyzed. Dube said good hand-eye coordination helps. In another experiment, they tag genes encoding the APC enzyme and another key neuronal protein with genes encoding green and red fluorescent proteins, respectively, to observe the location of the fluorescently labeled neuronal proteins inside the neurons of living worms. The goal is to better understand how the nervous system operates. 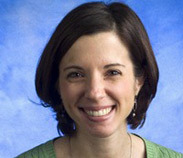 Kowalski said her interest in biology began in high school with an AP biology class that opened her eyes to the wonder of genes and cells and a teacher “who was so enthusiastic and just made it so much fun.” She went on to earn her bachelor of science in biology from the University of Notre Dame and her doctorate in cell and developmental biology from Harvard University. She did postdoctoral work at Tufts University School of Medicine from 2006-2009 – where she began studying C. elegans neurobiology – before joining the Butler faculty.